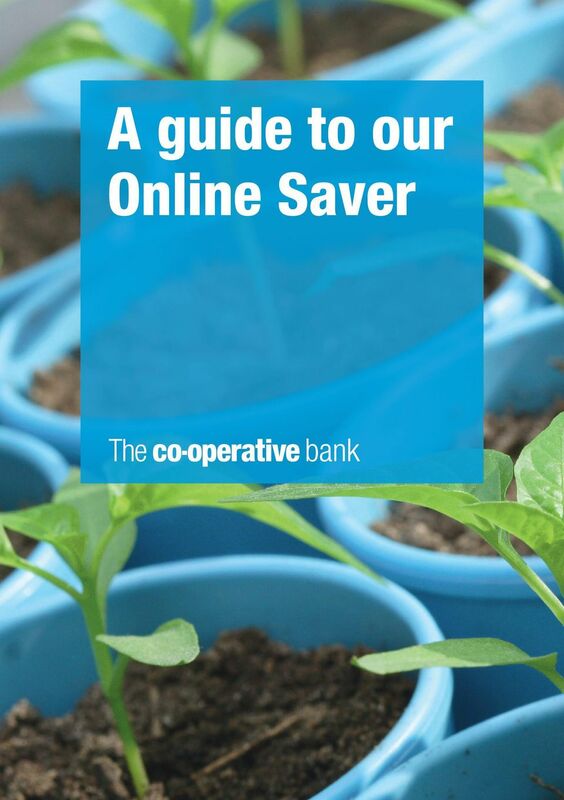 Download "A guide to our Online Saver"
2 Stay in control of your savings with easy access to your account online. To manage your savings on the go, simply download our Mobile Banking app and register for the service to make payments and check your balance. Features Easy access to your money online or on your mobile, whenever its convenient for you, 24/7. Make electronic transfers as many times as you want, whenever you want, to and from your account. Open from as little as 1. Eligibility To open an Account you must: be a UK resident aged 16 or over have either a Co-operative Bank Current Account, Current Account Plus, Privilege Current Account, Privilege Premier Current Account, Student Current Account, Cashminder Account, or any other account we specify in the future you must also be registered for and apply through our Online Banking. You can pay money in by Online & Mobile Banking Move money immediately from your Co-operative Bank accounts to your Online Saver whilst you re on the go using Online Banking or with our Mobile Banking app. This is an internal transfer, see overleaf for information about internal transfers. Funds Transfer & Standing Order Making an electronic transfer from any UK bank or building society. If you want to start regular savings with minimum fuss, why not set up a standing order? You can then sit back and watch your savings grow. For more information about Faster Payments, Standing Orders, BACS and CHAPs see overleaf. You can take money out by Online & Mobile Banking Move money easily whilst you re on the go by using Online Banking or with our Mobile Banking app. You can also transfer funds to any other UK bank or building society. Additional information Interest rates are variable on this product. Interest is calculated on the daily cleared balance in your account. Annual interest is paid on 5 April. Tax on interest is charged at the basic rate (currently 20%). If you re a non tax payer, you can register to receive your interest without tax deducted by completing an R85 form. 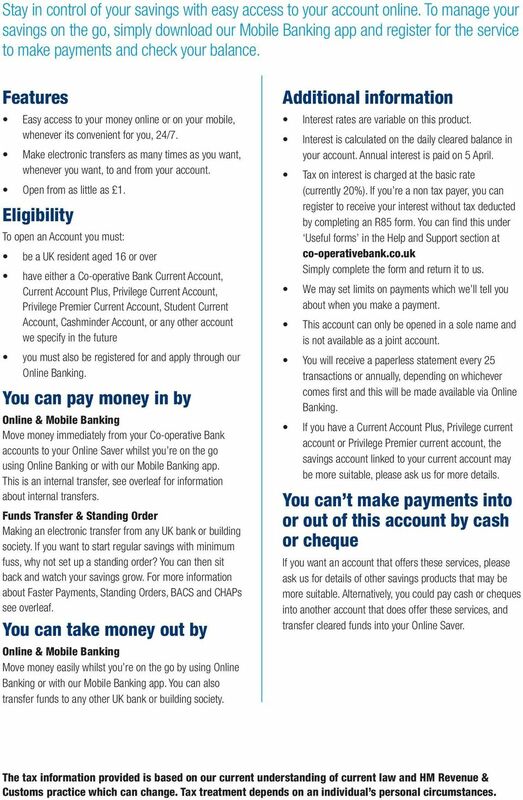 You can find this under Useful forms in the Help and Support section at co-operativebank.co.uk Simply complete the form and return it to us. We may set limits on payments which we ll tell you about when you make a payment. This account can only be opened in a sole name and is not available as a joint account. You will receive a paperless statement every 25 transactions or annually, depending on whichever comes first and this will be made available via Online Banking. If you have a Current Account Plus, Privilege current account or Privilege Premier current account, the savings account linked to your current account may be more suitable, please ask us for more details. You can t make payments into or out of this account by cash or cheque If you want an account that offers these services, please ask us for details of other savings products that may be more suitable. Alternatively, you could pay cash or cheques into another account that does offer these services, and transfer cleared funds into your Online Saver. The tax information provided is based on our current understanding of current law and HM Revenue & Customs practice which can change. Tax treatment depends on an individual s personal circumstances. 4 Other services Subject Access Request Status enquiry Under the Data Protection Act you re entitled to a copy of the personal information we hold about you. This charge covers our administration costs. A request made to a bank asking whether a customer is likely to be able to pay back a loan, credit or meet regular payments such as rent Copy statement For each additional copy requested. 5 (per statement) Other charges There may be occasions when we ll make other charges to the account. These will be notified to you at the time and you may request information about our charges for any service we offer in any of our branches or via our Telephone Banking service at any time. Plus postage, transmission and agent s charges where applicable. Payment Type Internal transfer A transfer between Current Accounts and/or Savings accounts with The Co-operative Bank and smile. This could be an immediate internal transfer or set up for a future date. Faster Payment A one-off electronic payment to an account with a UK bank or building society, subject to Faster Payment scheme limits. This could be an immediate Faster Payment or set up for a future date. Standing Order A series of regular electronic payments. These are set up on the account that you are sending the money from. BACS A one-off electronic payment to an account with a UK bank or building society. It takes 3 business days for funds to be received by the recipient bank. CHAPS A same-day electronic transfer, for any amount, to clearing banks in the UK in sterling. Once a CHAPS payment has been sent, it cannot be returned. CHAPS payments are subject to charges. Overseas payments An electronic payment to an overseas bank. 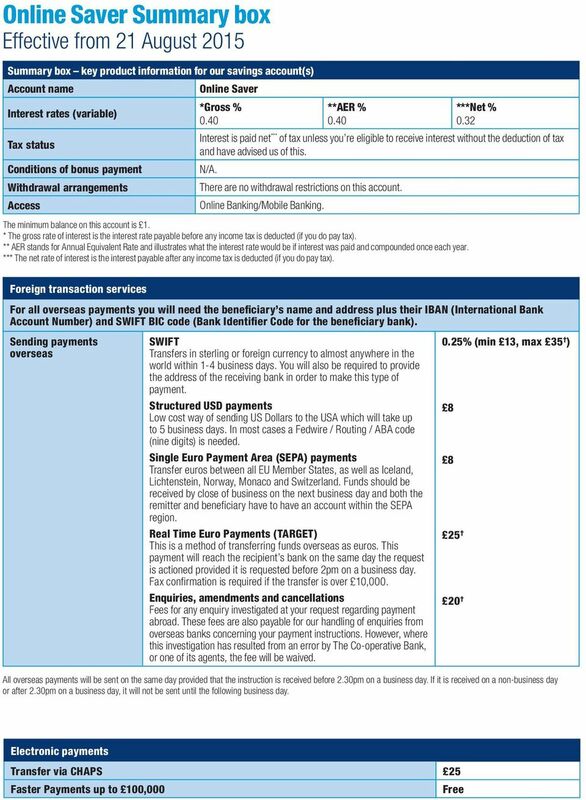 There are different types of overseas payments and these are described in the Foreign Transaction Services table overleaf along with any relevant cut-off times. When an inbound payment will be applied to your account # Funds deposited through an internal transfer will be applied to your account immediately on the day transfer is made. Faster Payments received will be applied to Standing orders received will be applied to BACS payments received will be applied to CHAPS payments received will be applied to Overseas payments cannot be made into your Online Saver. When an outbound payment will be made from your account^ Your payment will be sent on the date that you request. We are able to send your payment by internal transfer 24 hours a day 7 days a week. If you request an internal transfer to be made on a date in the future, it will be made on the due date. However, if the due date falls on a non-business day, the payment will be made on the next business day. Your payment will be sent on the date that you request. We are able to send your payment by Faster Payment 24 hours a day 7 days a week. If you request a Faster Payment to be made on a date in the future, it will be made on the due date. However, if the due date falls on a non-business day, the payment will be made on the next business day. 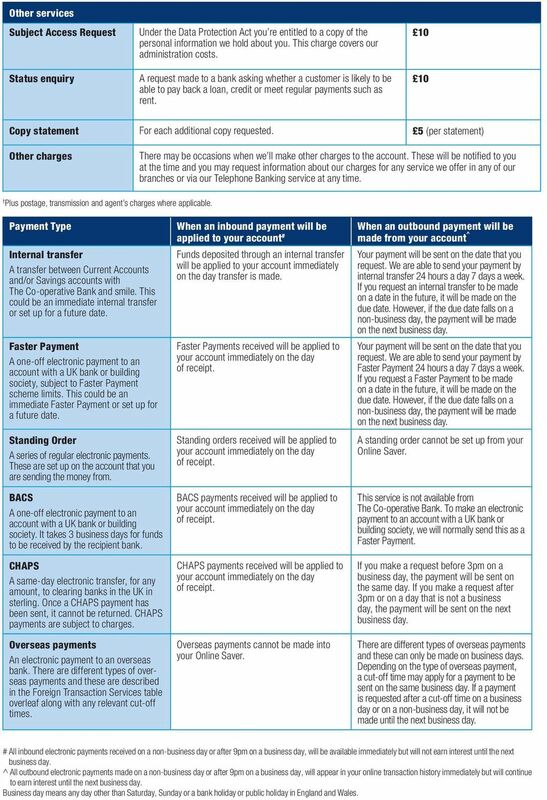 A standing order cannot be set up from your Online Saver. This service is not available from The Co-operative Bank. To make an electronic payment to an account with a UK bank or building society, we will normally send this as a Faster Payment. If you make a request before 3pm on a business day, the payment will be sent on the same day. If you make a request after 3pm or on a day that is not a business day, the payment will be sent on the next business day. There are different types of overseas payments and these can only be made on business days. Depending on the type of overseas payment, a cut-off time may apply for a payment to be sent on the same business day. If a payment is requested after a cut-off time on a business day or on a non-business day, it will not be made until the next business day. # All inbound electronic payments received on a non-business day or after 9pm on a business day, will be available immediately but will not earn interest until the next business day. ^ All outbound electronic payments made on a non-business day or after 9pm on a business day, will appear in your online transaction history immediately but will continue to earn interest until the next business day. Business day means any day other than Saturday, Sunday or a bank holiday or public holiday in England and Wales. 5 If something goes wrong The Co-operative Bank has well-established complaints handling procedures to ensure that all causes of concern are dealt with fairly and promptly. We know that sometimes things go wrong and we really value your feedback. By letting us know when you re unhappy with our products or services, we are given the opportunity to solve the problem as quickly as possible and we can improve our service for all our customers. Our promise to you Treat your complaint fairly. Try to resolve complaints when you first contact us. Send you a response in writing if we cannot resolve your complaint straight away. Keep you informed of our progress. There are a number of ways to make a complaint with us Call our helpline on to speak to one of our dedicated advisers. Visit your nearest branch and a member of staff will be happy to help you. Or write to us at: Customer Response, The Co-operative Bank, Ground Floor, Miller Street, Manchester M60 0AL. You can find more information by going to our website: co-operativebank.co.uk/complaints What happens next? We ll always do everything we possibly can to resolve a complaint straight away. Where this isn t possible, we will keep you informed of our progress until your complaint has been resolved. Not satisfied with our response? We re committed to ensuring all complaints are fully and fairly addressed. 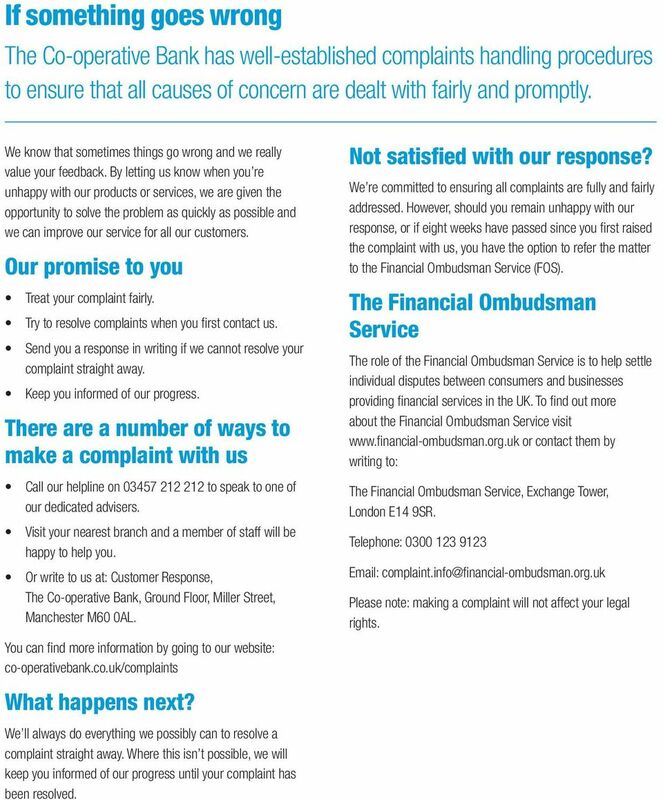 However, should you remain unhappy with our response, or if eight weeks have passed since you first raised the complaint with us, you have the option to refer the matter to the Financial Ombudsman Service (FOS). The Financial Ombudsman Service The role of the Financial Ombudsman Service is to help settle individual disputes between consumers and businesses providing financial services in the UK. To find out more about the Financial Ombudsman Service visit or contact them by writing to: The Financial Ombudsman Service, Exchange Tower, London E14 9SR. Telephone: Please note: making a complaint will not affect your legal rights. International Products & Services. Fees, charges and services explained.